1. Flashing Channels — Channels 8 in. wide with 1-3/4 and 3 in. flanges fabricated from nominal 16 MSG thick galvanized or aluminum-zinc alloy-coated sheet steel. Fastened to the frame with 1/4 in by 1-5/8 in. long anchors spaced 12 in. OC. 2. Interior Steel Liner — Panels available in nominal 32 in. widths fabricated from nominal 24 MSG thick galvanized or aluminum-zinc alloy-coated sheet steel. Fastened to flashing channels with 3/4 in. long sheet metal screws spaced 12 in.OC. Interlocking joints of adjacent panels sealed with factory-applied butyl caulking and secured with 3/4 in. long sheet metal screws spaced 12 in. OC. Butyl tape applied between the steel liner panels and the flashing channels to provide an air barrier. 3. Z-Bar Sub-Girts — Notched Z-bars 8 in. wide with 1 and 1-3/4 in. flanges fabricated from nominal 18 MSG thick galvanized or aluminum-zinc alloy-coated sheet steel. Spaced a max of 60 in. OC. Fastened to the steel liner panels with 3/4 in. long sheet metal screws spaced not more than 8 in. OC. 4. Ceramic Fibre Blanket — Density 8 pcf , 1/2 in. thick, min 4 in. wide, attached to the Z-bar sub-girts with stick pins spaced 10 in. OC. 5. Batts and Blankets* — Two layers of mineral wool batts, 24 or 32 in. wide by 48 or 60 in. long by 4 in. thick. Mineral Fibre Insulation, min density 4.5 pcf, installed with joints staggered a min of 12 in. within each layer and between adjacent layers. 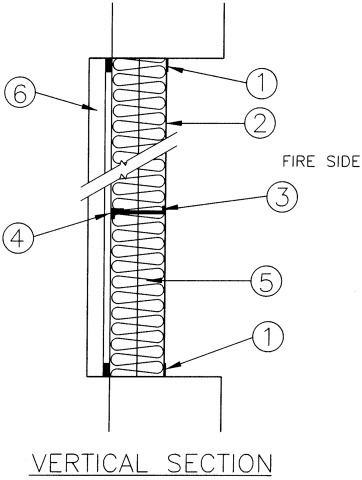 The overall thickness of the wall may be increased provided the Mineral Fibre Insulation (item 5) is used to completely fill the wall cavity, and provided the size of the Flashing Channels (item 1) and Z-Bar Sub-Girts (item 3) are increased to match the thicker wall. ROCKWOOL — Type "Roxul Safe 55"
6. Exterior Cladding and Accessories — Corrugated panels, available in various profiles and nominal 36 in. widths, fabricated from nominal 24 MSG thick galvanized or aluminum-zinc alloy-coated sheet steel. Fastened to the Z-bar sub-girts with min 3/4 in. long sheet metal screws spaced 12 in. OC. Fastened to flashing channels with 3/4 in. sheet metal screws spaced 12 in. OC. 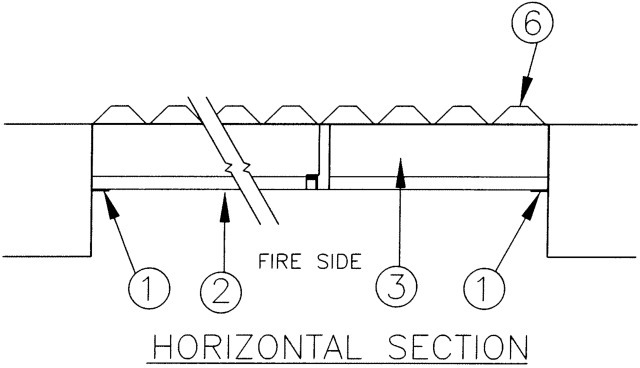 Side lap joints of adjacent panels fastened with 3/4 in. long sheet metal screws spaced 16 in. OC. The top and bottom of the exterior cladding are trimmed with cap and drip flashings respectively.